we want to take this opportunity to say thank you!!! Thank you for the growing trust that put towards us and thank you for the faithfulness many of us have shown us for several years now. We are also very happy for every new client that crosses our path, as well as every breeder that accompanies us from year one. This is reason for us to show our appreciation in form of a breeder oriented service by providing photo and video material for marketing their foals. We are able to offer appointments immediately, by confirming via telephone. These appointments will take place on our stud farm and are free of charge. So as soon as the first foals arrive, you are welcome to get in touch with us if you are interested! We can look back to a very successful but mostly a very joyful breeder’s year. All our studs have developed amazingly in riding terms and can prove amazing sportive successes in their age appropriate classes. 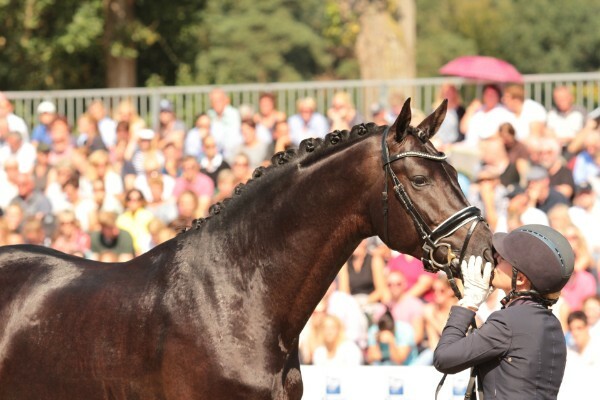 Winnings in basic tests was part of the year, taking part in the Bundeschampionat and receiving the golden victory bow in S-Dressage all took place. From a breeding point of view, surely the first Körungsjahrgang of Finest has to be mentioned especially! Many apporvals for the Körplätze in series and altogether 8 positive Körurteile in Hannover, Oldenburg & Westphalia were gathered. It also gives us a lot of pleasure, that hardly a foal show passes without one of our own foals - breeding that way brings a lot of fun and happiness!! !